Built in 1961, this captivatingly pretty yacht was built in Sweden in 1961. She is currently with her second owner being purchased in the 1980’s, sailing in the summer, and tucked up safe and sound in a shed every winter, she gleams from top to toe showing off every twist and turn of spit and polish. Designed by Arvid Laurin, and built of Honduras mahogany on laminated oak frames, she was epoxied and glassed beneath the waterline in 1994; her clean interior bilges in GRP are a dream to behold. 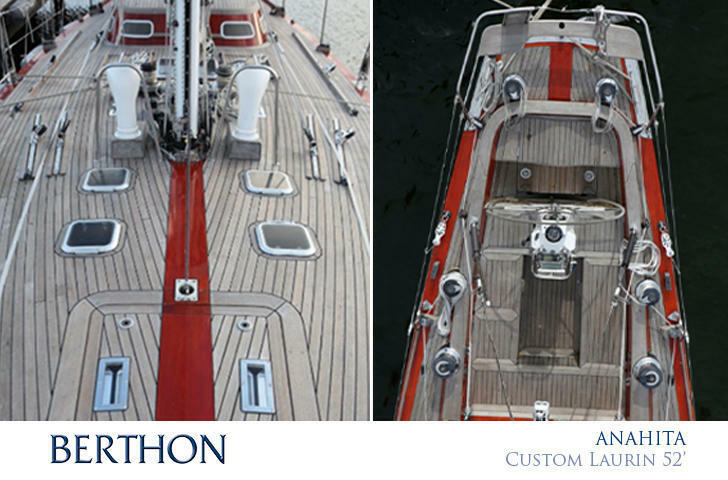 Her teak decks are on pine beams and they were fully re-caulked in 2014, her stem is stainless steel on oak. With her varnished topsides and gleaming upperworks she has plenty of row-away appeal. Down below her accommodation is traditional and practical for family sailing. It doesn’t pretend to offer loft living or to come with acres of Corian and designer fittings. It is traditional, honest and the joinery is quite beautiful and it is much the same as it was on the day that she first launched in 1961. However, there is stacks of potential to tweak it to stamp her new owner’s personality thoroughly on ANAHITA in her new life. On the quiet, she is pretty potent weaponry on the race track, courtesy of some Peter Norlin wizardry beneath the waterline which seriously enhances her rocket power. She has given her current owners enormous pleasure in regattas in her native waters and she would do well in events such as the Panerai circuit in the UK or indeed in the swathe of Mediterranean regattas where contemporary classic racing is all the go. ANAHITA is asking 2 million SEK which at today’s exchange equates to around £160,000. For such a stunning looking 52 foot classic with absolutely all the bells and flutes, this does not strike us as a massively large amount of splosh.